The IFRS Foundation is pleased to announce that the 2013 International Financial Reporting Standards (Red Book) is now available. Copies are priced at £65 each, plus shipping. This edition includes Standards that have an effective date after 1 January 2013. It does not contain documents that are being replaced or superseded but remain applicable if the reporting entity chooses not to adopt the newer versions early. Discounts are available for multiple copies, academics/students and residents of middle and low-income countries. If you require further information on the 2013 IFRS (Red Book) (ISBN: 978-1-907877-77-3; product ID: 1734), please visit our Web Shop. The 2013 IFRS (Red Book) is also available to purchase as a PDF download (product ID: 1741), priced at £65; no further discounts apply to this product. eIFRS and Comprehensive subscribers can now access the electronic files of the 2013 IFRS (Red Book) via the Latest Additions section of eIFRS (you will be required to provide your login details). Comprehensive subscribers will soon receive a printed copy of the 2013 IFRS (Red Book) by mail. If you wish to purchase a Comprehensive Subscription please visit our Web Shop. NOTA DEL AUTOR: En Venezuela, las entidades que reportan de acuerdo con los VEN-NIF, deben aplicar las NIIF Completas correspondientes al Libro 2010, de acuerdo con lo establecido en el BA VEN-NIF No. 8, Versión 0. 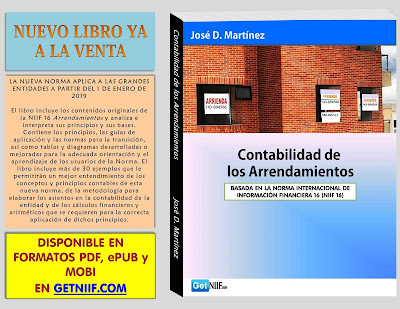 El Libro 2013 será aplicable únicamente por aquellas entidades que reportan bajo las NIIF Completas, sin tomar en cuenta los BA VEN-NIF.